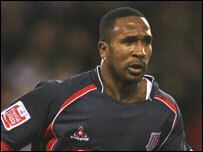 Stoke City top scorer Ricardo Fuller has agreed a deal to extend his stay at the Britannia Stadium until 2011. "On his day Ricardo is one of the best strikers in this division," said Stoke chief executive Tony Scholes. "We believe that signing him up to a longer contract shows how serious we are about taking the club forward." The 28-year-old Jamaican international striker has hit 19 goals in 47 starts, since his August deadline day move from Southampton 16 months ago.